Queanbeyan chiropractor Dr Marcus Chacos and his team focus on restoring your body’s innate healing power with natural vitalistic healthcare. The nervous system governs all healing within the body. When there is interference with this all-important system, the body can’t work at its optimum levels. By removing these interferences, your body can regenerate and operate at its peak performance. The history of chiropractic dates as far back as ancient China, Egypt and Greece. 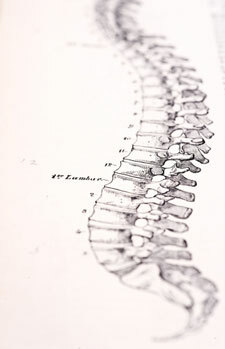 Ancient records show that practitioners performed techniques on the spine, giving pain relief. However, it wasn’t until 1895 that a man called David Palmer began making these techniques more widely known. Palmer made a simplefavicon adjustment to the neck of a deaf man, Harvey Lillard, and it restored his hearing. Thinking he had found a cure, Palmer continued adjusting deaf people. Although he didn’t reproduce the same results as he had with Harvey, Palmer did notice that his patients were experiencing less pain, fatigue, headaches and other symptoms they had reported before treatment. This ancient technique was named chiropractic, translated from the Greek meaning “done by hand”. The single basic premise of chiropractic is that all living things have an inborn or innate healing ability that works constantly to maintain our health, or heal us when we’re injured or diseased. Dr Marcus and his team of chiropractors seek to remove interference to the function of your spine and peripheral joints, restoring normal movement. The appropriate nerve signals can then be sent via the spinal cord to the rest of the body, allowing normal function of all muscles, bones and organs. Your healing abilities are affected by your diet, environmental factors such as pollutants and chemicals, exercise, inherited traits from your parents and your emotional state. Your immune system also works around the clock to keep you functioning at 100%. Your body is constantly being patrolled while dangers such as bacteria, viruses, dirt, cancer cells and dead cells are being destroyed. The single most important factor, however, is our innate healing potential that exists within every one of us. When there’s irritation in your nervous system, you may experience lowered resistance to disease and damage to your health. Chiropractic care removes any interference and may result in improved immune function leaving you happy and healthier with fewer aches and pains or colds and flu. Chiropractic care truly can enhance your body’s resistance to disease while increasing your quality of life. Chiropractic is gentle, safe and effective. An adjustment relieves irritation to the nervous system that interferes with our natural healing abilities. Through this process, we seek to awaken the process of self-discovery and inner healing. The purpose of chiropractic is to remove interference to the innate intelligence of the body and therefore the self-healing mechanisms activate. In this way chiropractic emphasises wellness and restores the natural healing capacity of the body. Chiropractic care may be appropriate for a wide range of ages, needs and health conditions. Give your game a winning edge by improving your athletic ability. Chiropractic care may help you stay healthy and free from injury while enhancing the performance of each system in your body to play at your peak. Many sports players in a variety of athletic competitions seek the aid of sports chiropractic to give them an edge. Chiropractic care may alleviate back pain, rehabilitate chronic pain and help you return quickly to work and your daily activities. Other benefits may include the normalisation of function and improved mobility. Jumping, running, falls and accidents are normal parts of childhood. These incidents can cause trauma, however, starting with the birthing process, and can produce irritation in a child’s developing nervous system. Chiropractic care can restore function to the body, returning balance to your family. Children with learning difficulties or behavioural problems may respond well to chiropractic care. By giving the nervous system a boost, all aspects of your child’s health can be improved, including their emotions, learning and behavior. Discover what we may be able to do for you. Contact us today! Free parking is conveniently available on-site.